The all-too-small window for outdoor dining in Prague opens too late and slams shut all too soon. So I grab every chance I can get for eating al fresco. When my friends started buzzing about the food and the back garden at Peperoncino, I checked my weather app and reserved a table. 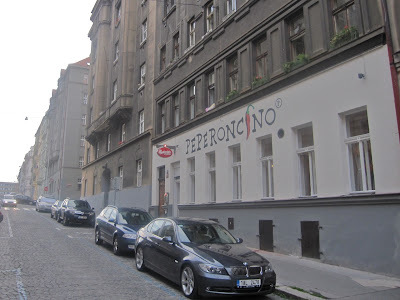 The Italian spot is in a residential area not far from Letenský zámeček beer garden, a favorite outdoor hang out of mine on warm evenings. We passed through the small dining room on the way to the garden. The brick arch and the black and white verses on wall are a nice touch. The poem is "Longing for the South" by Konstantin Miladinov. On the downside, the white walls were bare and boring, the simple chairs were not to my taste, and the room was cacophonous and cramped when full. I never did eat inside there, though. 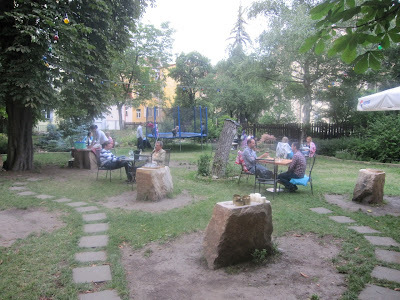 The unkempt back garden is huge, with tables sprinkled around the vast expanse. On sunny days, it's good to get a table in the shadow of a tree as there were no umbrellas. It is child friendly, with some toys including a net-enclosed trampoline in the back. I was given a table right next to it with four shrieking children bouncing inside. The waitress kindly helped me carry the table to the other side of the garden. 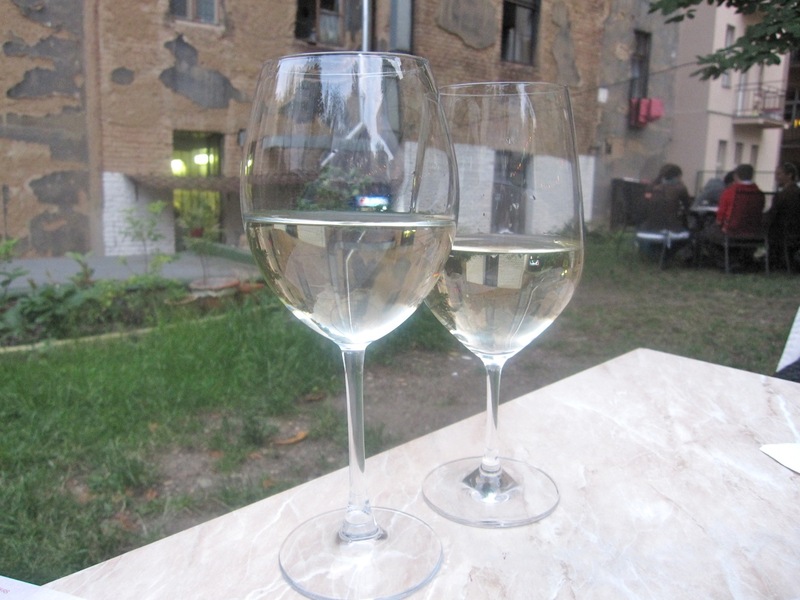 We started with some crisp, dry Pinot Grigio (55 CZK/.1 liter). Then we had the bruschetta pomodoro (85 CZK). This was not the typical version you'd find at many other places around town. 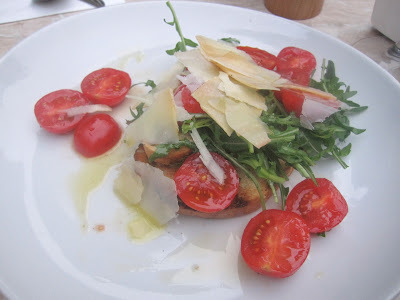 On the good bread were cherry tomato halves, rucola, shaved Parmesan, and olive oil. I was hoping for some basil. It was more like a simple little salad on toast. I got what I usually get at Mediterranean-style places, the risotto frutti di mare (150 CZK). It was stocked with mussels, clams, and calamari. It wasn't bad and the price was a bargain. I did think it was on the bland side, especially compared with other versions around town. 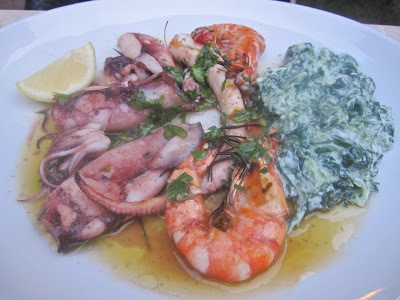 Then we had the grilled calamari, shrimp, and octopus (190 CZK). This was good. The seafood was very fresh and had great smoky flavor from the grill. The calamari was even slightly charred. We ordered spinach with ricotta on the side (55 CZK). It was a nice complement. 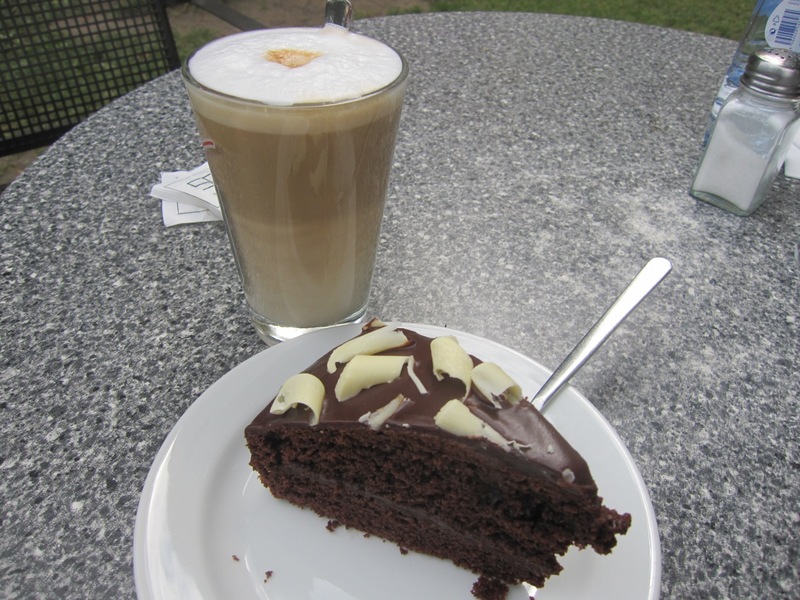 For dessert on the first visit, I avoided my usual tendency toward chocolate. 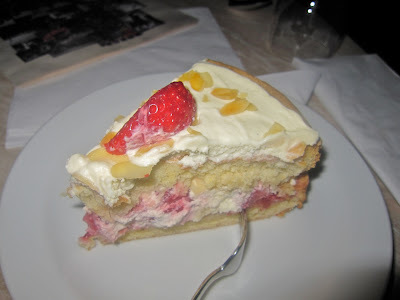 I ordered the cake with mascarpone and strawberries (66 CZK). It was pure heaven. The light, springy homemade cake was a great platform for the sweet strawberries and cream. I've been dreaming regularly about this dessert. The bill for this visit was a very reasonable 740 CZK. 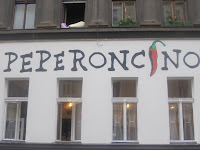 On the next visit, we started with the grilled octopus alla Peperoncino (165 CZK). The tentacle came in a tomato sauce with green beans and potato. The octopus was very tender, but had a fishy flavor. Of course, I had to try a pasta. I got something I've never had before: Spaghetti Caprino (99 CZK). 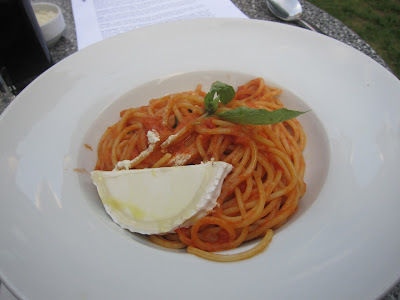 It had tomato sauce, fresh basil and goat cheese. My Italian friend pronounced the pasta properly cooked. The cool cheese melted and mixed in with the sauce, making it nice and tart and creamy. I liked it, but my only gripe was that I wanted more than two basil leaves. Then, I had the 200 gram filet steak with green pepper sauce (345 CZK). The meat was excellent. It was very tender and had just a little smoke flavor from the grill. However, the sauce was not good. It was thin, with the cream separating, and it was too salty. 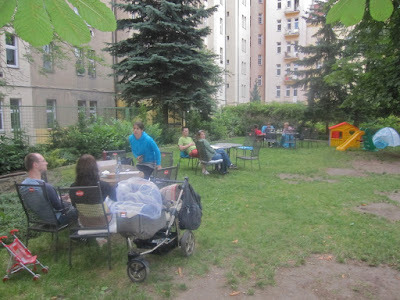 The grilled vegetables were fine (55 CZK). There were peppers, eggplant, and zucchini. 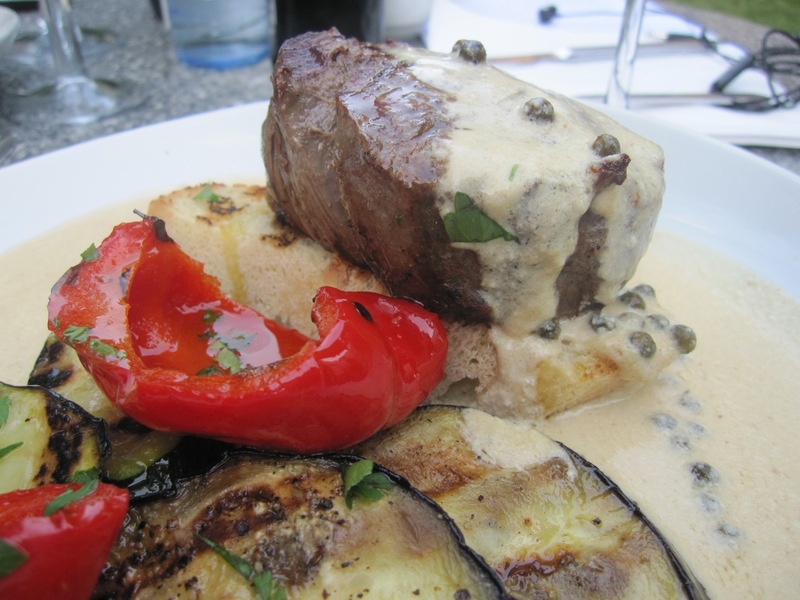 On another visit, I had the same steak but with the balsamic vinegar sauce. The steak was tender but had no grill flavor this time. The sour sauce was also too salty. I didn't like it. 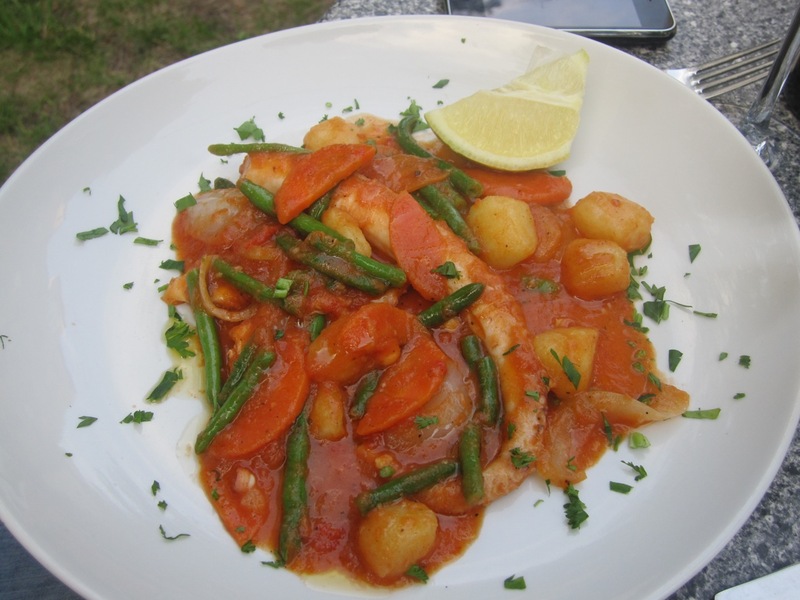 The caponata siciliana was mostly tomato sauce (60 CZK). 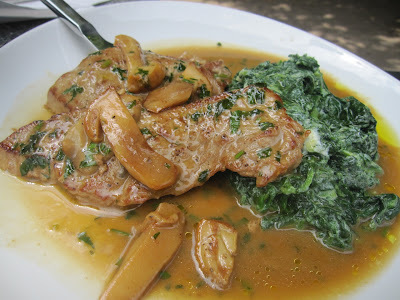 My friend got the veal with porcini mushrooms (245 CZK). Again, the meat was very good. But the sauce on top was way too salty. For my final dessert, I could not resist the chocolate cake (66 CZK). 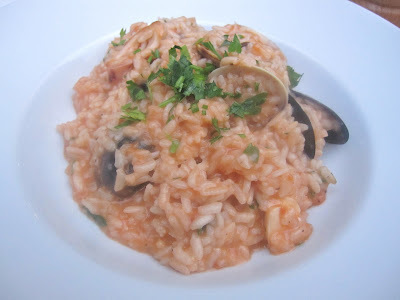 It is homemade and simple, but good stuff. I liked it, but the confection could not displace my highest affection for the strawberry cake. I must have more of that. 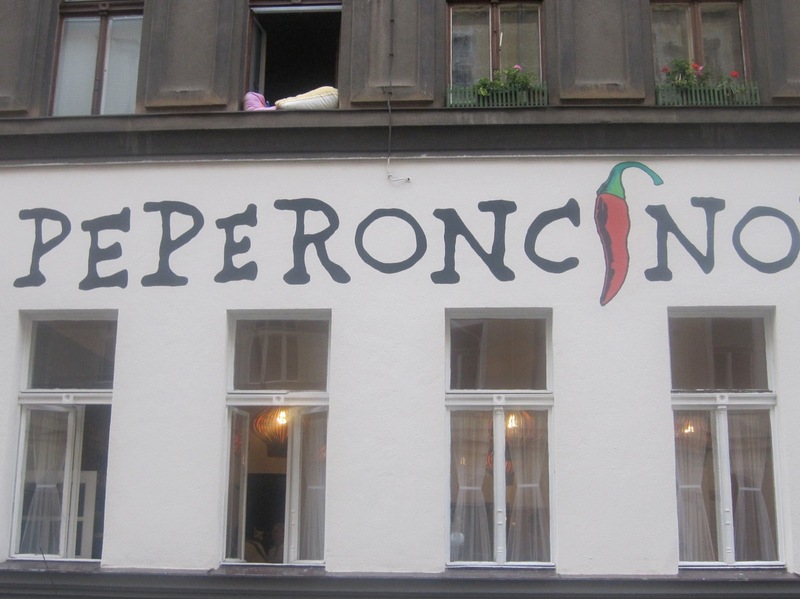 In the end, I have very mixed feelings about Peperoncino. The prices for many offerings were great, though you have to consider that side dishes cost extra. I'll be more than happy to return while the weather stays good and sit and the garden, drinking wine with grilled seafood and pasta. I just think the kitchen needs a little more talent. Or a little less salt. Just found your blog. It's wonderful. I will be in Prague in 3 weeks, and be celebrating my wife's and my 30th wedding anniversary. Any thoughts on a special restaurant that we would enjoy? We will not be able to dress up really fancy, but will have casual dress. Thanks for your thoughts! enjoy your blog, brewsta. good work. 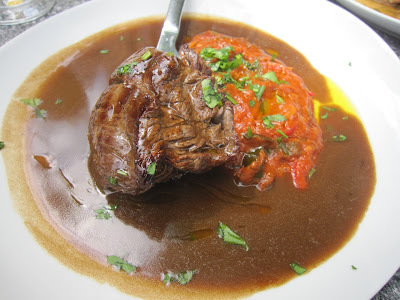 One of my favorite restaurants right now is Chagall's Club. 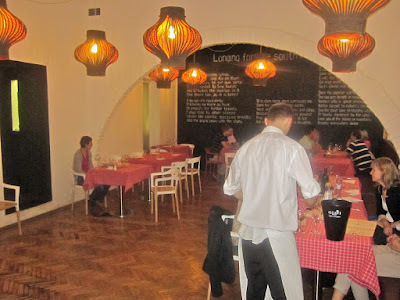 Great cooking, classy but casual dining room, decent prices (for the quality). Wine list is a little pricey though. Other options: Artisan in the Smichov/Andel area. Or U Emy Destinnove in New Town, not far from Wenceslas Square.